Now more than ever, PR professionals who have direct relationships with reporters, access to leaders within our organizations, and highly visual and innovative story ideas that deliver compelling images and footage are the keys to successful story placement. Editorial departments remain strapped for time. Newsrooms are smaller and most media outlets are still sorting out the paradigm shift in revenue streams brought on by the decentralization of the media, and the growth of social platforms and diverse devices capable of accessing and distributing content. …because we are mucking up our own history. How is the public supposed to determine the difference between real news and what’s fake? (Here’s a great infographic that shows the How-to, Click here.) We have a hard enough time each day determining what news is truth among fiction in the here-and-now. Add to that the priority of speed over truth and we’ve mixed up a soup du jour of fact vs. fiction with little hope of determining what’s what. What will happen when today becomes yesterday, the truth is still not clear, and we begin recording a jumble of facts and fictitious rubbish that we will call history? We used to be able to rely on news organizations’ fact-checking capabilities to ensure the truth of a story. Citizen journalism and social media has changed all that and the result is rampant confusion and skepticism. This is especially true for those charged with chronicling our history among archivists, librarians, curators and news organizations who are working to verify the truth and purge the impertinent at an unprecedented pace. Who has time for two-source fact verification with only seconds to post a story? I was struck by this concept on a recent visit to the 911 Memorial Museum in New York City. A wall of newspaper headlines from around the world told the impact of this devastating event. I asked myself what this might look like if this tragedy played out in today’s climate of fake news? And, what would the public’s initial reaction be? Would they even believe it? Check out the infographic published by the International Federation of Library Associations and Institutions (IFLA), based in The Hague, Netherlands. Here, they are showing how to determine the difference and get smart about what we are reading and watching. (Years ago, who could have predicted we needed this?) To drive this point home further, The New York Times ran a story shortly after the 2016 Presidential election that tracked a fake news story and showed how it went viral. These are real occurrences, whether intentional or accidental when the wrong information moves from folklore to fact in a fraction of a second. This affects people, and lives are impacted. It’s important that we know what we’re reading and sharing, and where it came from (The New York Times is a credible source). To do that, we have to get past gullible and learn the common-sense street-smarts of news fact vs. fiction. As public relations professionals, how can we rise above the fray to bring a real, newsworthy story the kind of attention it deserves? 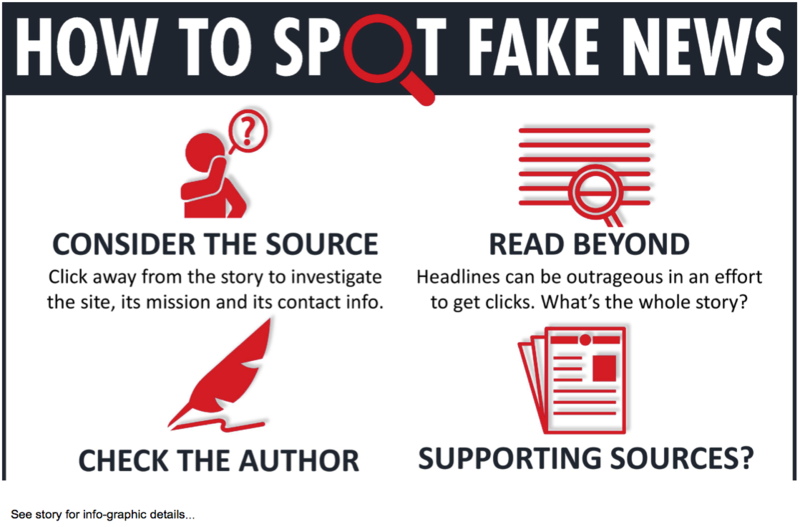 The answer is not easy, but simple: think, act and respond like a newsroom. In our next post, we’ll talk about how to do that and how to structure an organization to make it happen.